We love the overprint used in the logo to highlight each color. 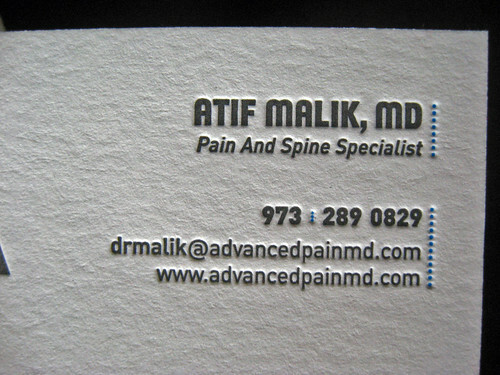 Here are some business cards we printed for Atif Malik, a pain and spine specialist at Advanced Pain Management Services in Maryland. 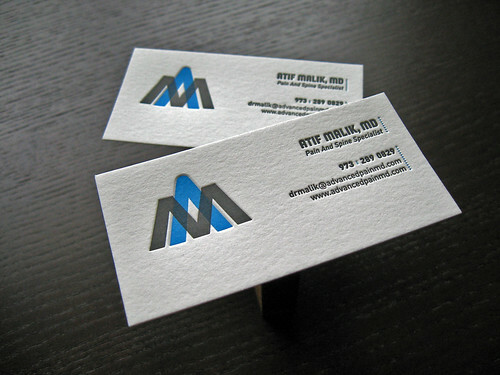 Styles for business cards vary widely from person to person and especially from business to business. The reason we wanted to post these cards on the blog today was the unique style and use of overprinting in the logo. Read more about overprinting and see more photos after the break. The business cards were printed on 110lb Crane’s Lettra in two colors: process blue and dark gray. The finished size of the cards is 1.75″ x 3.5″. 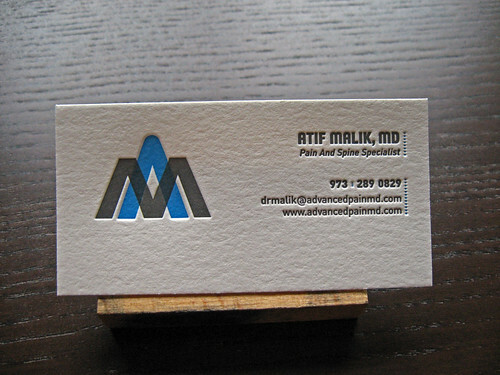 Changing the proportion of the cards from 2″ to 1.75″ helps to elongate them. 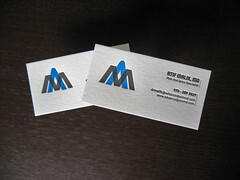 The client supplied the design and layout for the business cards. Overprinting is something that we’ve talked about before, like we did with these cards for Untitled Studios in Australia (Untitled Letterpress Business Cards). So what is overprinting? It’s when two colors overlap to create a third color. With letterpress, where each color requires an additional run the through press, you can take advantage of overprinting to add more color to the design or save on printing costs. 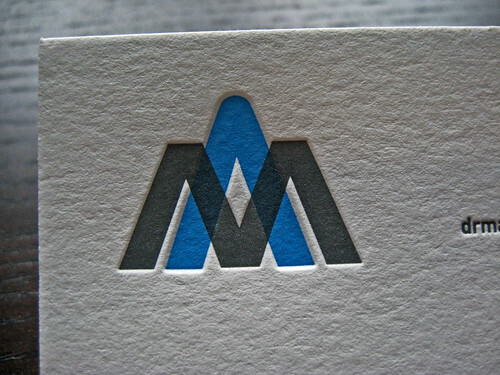 The third color is created when two colors overlap because of the transparency of ink printed via letterpress. 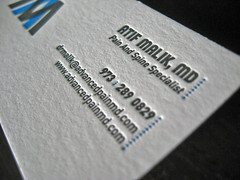 Overprinting works best with light colors because when you overlap colors they create a darker color. If you want to know how overprinting will look while you’re designing you can enable overprinting preview in Adobe Illustrator. If you’ve got a design featuring an overprint or are interested in a custom design, contact us for more information. We like how they included the blue color in the contact information. 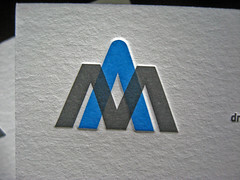 The touch of blue helps to tie it to the logo and adds visual interest. 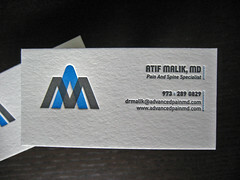 Below is another 3D (stereoscopic) photo we created of Atif’s cards. We tried to include a little more perspective in this photo to help it pop off the page. Cross your eyes until the images overlap and then bring the image into focus. If you’ve got questions about overprinting, custom design, or anything else post them in the comments below and we’ll be sure to respond. Also make sure to let us know what you think of the 3D stereoscopic photos we’ve been taking. We like anything 3D and think they’re cool, but if you don’t let us know!